The User Experience scripts of Jamo Solutions are started by NeoLoad via the Command Line advanced action. 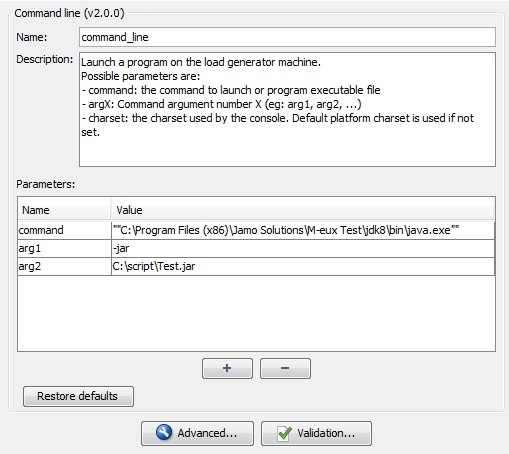 The command attribute must contain the Java program used by the Load Generator to execute the Jamo script ("java" to use the default Java program, or the full path of the program to use a different one). command attribute: ""C:\Program Files (x86)\Jamo Solutions\M-eux Test\jdk8\bin\java.exe"". Make sure to keep the double quotes to take the spaces into account in the executable path.